***Editor’s Note: “Afterlife with Archie” is an ongoing comic book series, but it’s the trade paperback collection “Afterlife with Archie: Escape from Riverdale” (issues 1-5) that is specifically being reviewed here. First things first: if you’ve never heard of Archie, it’s probably best that you stop reading this review, go find the childhood that you seem to be missing, and join the rest of us red-blooded American types (special exemption to our overseas readers, although you may very well be familiar with Archie as well!). Archie Andrews is the fictional, prototypical “all-American” teenager, first appearing in comic-book form all the way back in 1941, in Pep Comics #22. (Fun fact: the Pep Comics series has several other claims to fame in addition to the first appearance of Archie, including: the first “patriotic” hero, The Shield, who predated Captain America by over a year; and the first superhero to die, The Comet.) Since his debut, the perpetual-seventeen-year-old has starred in over 10,000 newspaper strip and comic issues (seriously – with over 2 billion total copies sold! ), six animated television shows, a radio show that ran for 10 years, and a live-action TV movie (Google it, it’ll blow your mind). He’s been a super-hero (Captain Pureheart, natch), sang a Billboard #1 hit song (believe it or not, the 1969 song “Sugar, Sugar” was an original creation for his band, The Archies), and has “met” such other pop culture icons as President Obama, the Teenage Mutant Ninja Turtles, KISS, the cast of “Glee,” and even the ultimate Marvel Comics vigilante killing machine, the Punisher. And of course… he also fights the undead. That’s right, true believers: the vanilla-as-all-getout, 7-plus-decades-as-a-do-gooder Archie is now stuck in a world of reanimated corpses. 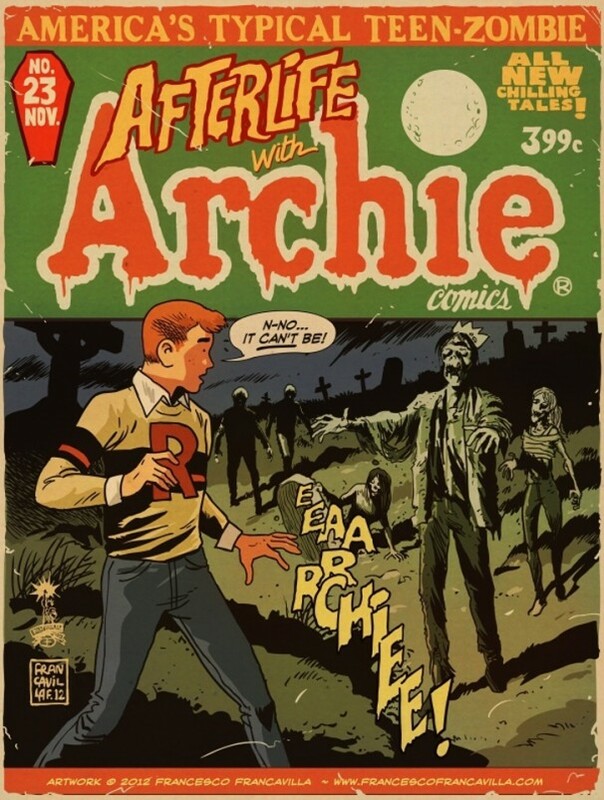 At least, he is in the “alternate reality” existence of Afterlife with Archie, a side-series of ongoing monthly comic issues that is, interestingly enough, the first title in the 70-odd years of publisher Archie Comics’ existence that not only was sold only in comic shops and not on newsstands, but is also their first-ever comic to feature a “teens and up” rating. Keen! And what about the story itself, you ask? It’s serious fare, your age-old tale of love lost, really. Hot Dog, the faithful mutt of Archie’s best pal Jughead, gets hit by a car and dies. Jughead asks his neighbor Sabrina (of fellow Archie-published comic book Sabrina the Teenage Witch) if she might be able to do anything to help. As luck would have it, the angsty sorceress and her two pagan aunties just happen to have the Necronomicon laying around their house, so Sabby goes against her aunts’ wishes and reanimates the pup. (Sabrina’s aunts banish her to the nether-realms as disciplinary action for disobeying their orders; who says corporal punishment doesn’t work?) Wouldn’t you know it, something goes wrong: Hot Dog is just not his former happy-go-lucky self, and after getting a sizable bite taken out of him, Jughead becomes the King of the Zombies and starts to infect the humble residents of Riverdale. All on the same night as the big school dance, darn the luck! All in all, not too shabby for an ongoing comic series that sprung to life pretty much on a whim from an editor after Francavilla delivered a “zombified” alternate cover for Life with Archie #23 back in 2013. 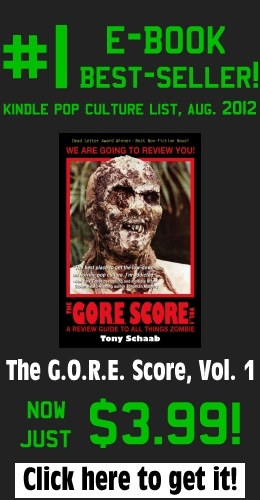 I’m particularly interested to see where the series goes from here and how long it can viably sustain not only a coherent storyline but also the readers’ interests. If Afterlife with Archie, Vol. 1 is any indication, they should have plenty of rotting leg on which to shamble forward.